Clematis 'Honora' is a wonderful, non-evergreen climber which will happily cover walls, fences, pergolas, trellises or even grow up through a large shrub or tree within the flower border to create a beautiful display with its velvety, royal-purple flowers with a reddish stripe and maroon centres that are produced in great abundance from June to August. 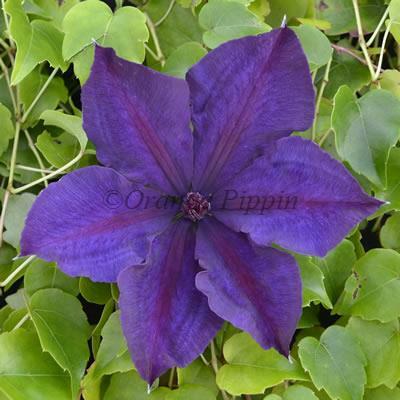 Clematis 'Honora' was discovered and named by Mrs. A. Edwards of Christchurch, New Zealand. The name is Maori.